Need help installing a cart tire onto your rim? Austin will walk you through the steps for easy and carefree installation! The example being used in this video is Marathon's 20x2.0" Flat Free Cart Tire. What's the difference between a rim and a hub? A tire and a wheel? A bearing and a grease zerk? 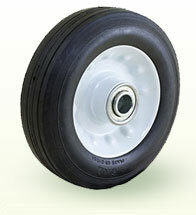 Tire-Lingo can be confusing and make a seemingly simple task such as replacing a wheelbarrow tire, seem like a burden. In this video, Austin identifies the different parts of a tire so you can speak like a pro and find the exact tire you need. Need to purchase a new tire or replace an old one but don't know which one to get? This video will help you understand tire measurements to find the right tire for your equipment. Looking for a replacement tire? You've probably been asked questions such as "What's your hub length? ", "What's the bearing size", "Are you replacing the tire, rim, or both?" What do these things mean?! Austin at Marathon Industries has the answers! In order to replace a tire, you will need to get proper measurements of your old tire. In this video, Austin identifies the four main tire measurements needed and how to accurately get them. 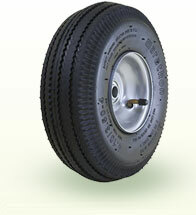 You will need the width of the tire, the diameter of the tire, the hub length, and the bearing size. 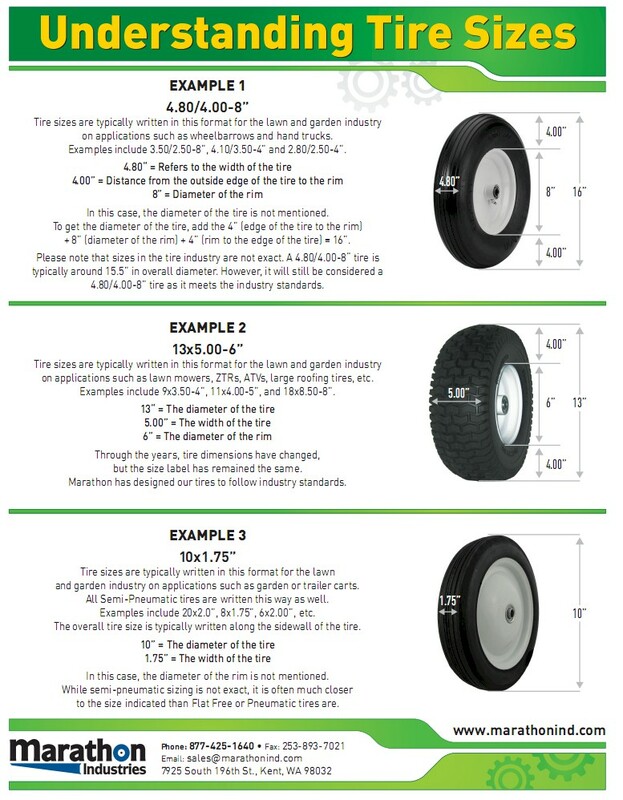 With these four measurements on hand, you can find the perfect replacement tire for your equipment! 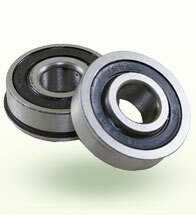 All bearings eventually wear down over time and at some point, may need to be replaced. Should you need to replace a bearing or swap one out for a different bearing size, Austin will give you the "How To" so you can change out your tire bearings efficiently. Please note that Austin uses a screwdriver to remove the bearings because that is a common household tool. Screwdrivers are not intended as “striking” tools and a steel rod or other strong metal rod may be more effective. Use a screwdriver at your own risk. Have a flat tire? Austin at Marathon Industries shows you how to change your old, air-filled tire on your current rim to a new tire so you can get rolling again! Tired of Flats? Austin shows you how to replace your old wheelbarrow tire with a Marathon Flat Free Wheelbarrow Tire! Follow the steps for easy tire installation. Changing a tube in a flat tire can be frustrating! Austin shows you the step-by-step process to change a tube in a flat tire. All you need is a screwdriver, a replacement tube, and a lot of patience. 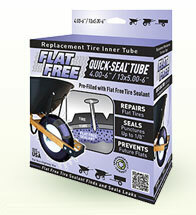 Or, if you're done with flat tires and replacement tubes, check out Marathon Flat Free Tires! Made of polyurethane foam, these tires are solid all the way through so you'll never have to replace a tube again! 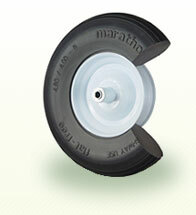 Marathon makes it easy to find a replacement wheelbarrow tire with our Universal Fit Flat Free Tire Kit. Included in each Universal set is a spacer and bushing kit which can be used to adapt our tire to your equipment. 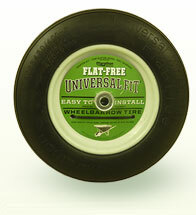 Austin shows you how simple it really is by installing this Universal Fit Flat Free Tire on his wheelbarrow. 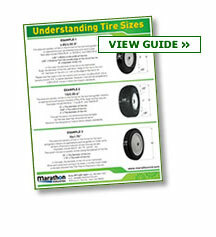 Marathon makes it easy to find a replacement hand truck tire with our Universal Fit Hand Truck Tire Kit. Included in each Universal set is a spacer and bushing kit which can be used to adapt our tire to your equipment. Austin shows you how simple it really is by installing this Universal Fit Flat Free Tire on his hand truck. Have a flat tire? Austin at Marathon demonstrates how to inflate your tire safely and get you rolling again! 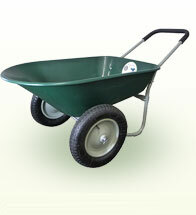 Watch this video to learn step by step how to assemble our Ultimate Wheelbarrow. Watch this video to learn step by step how to assemble our Yard Rover. In this exclusive video, Jack Harper goes behind enemy lines to try to find a Marathon Flat Free wheelbarrow tire. Jack discovers the Marathon Tire and will try for weeks to make a Marathon Flat Free tire fail. Tire Destroyer Jack Harper attempts to defeat a Marathon Flat Free wheelbarrow tire. See Jack's first of many attempts to cause a Marathon Flat Free tire to go flat! 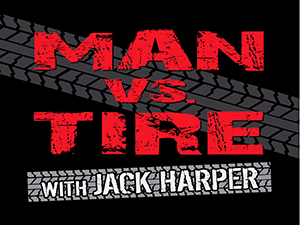 Jack Harper continues to battle the Marathon Flat Free wheelbarrow tire. Nails couldn't stop a Marathon Flat Free Tires, but Jack is convinced a drill will cause a Marathon tire to go flat! Jack Harper relentlessly fights with Marathon's Flat Free Tires. After failing to stop a Marathon Flat Free Wheelbarrow Tire with Nails and Drills, Jack turns to his trusty saw to cut up a Marathon Flat Free tire! Jack Harper expresses his frustration with three failures in a row. Nails, Drills, and Saws didn't work, so Jack is taking his training to a new level in an attempt to cause a Marathon tire to go flat! After some tough training, Jack Harper takes it to the next level to defeat Marathon's Flat Free wheelbarrow tire. Drills, Nails, and Saws haven't done the trick, but surely an Axe will be able to make a Marathon Tire go flat ... Or will it? Jack decides to take this "tire destroyer" thing to the next level against Marathon's Flat Free wheelbarrow tire. Nails, Saws, and Drills couldn't stop the Marathon tire. Will fire finally help Jack in his quest to stop a Marathon Flat Free Tire? Jack Harper tries once and for all to defeat Marathon's Flat Free wheelbarrow tire. Drills, Axes, Saws, Nails, Fire, and Explosives can't stop a Marathon Flat Free Tire.